BCMCL held its historical Junior six-a-side with weather not in cricket's favor. Despite of the rain it did not stop our talented juniors from having a great tournament at the Stanley Park. We saw some great display of hard hitting and sensible bowling from the BCMCL juniors. We would like to thank Salim Mohammad and Hardeep Ghuman for organizing the event with such success. Special thanks to Jim Richards and Mumtaz Khan for their involvement in scoring and umpiring. Abbotsford Juniors were the Champions and West Vancouver Juniors were the runners up. Sunny Gainder was the best batsman and Satnam Randhawa had the highest number of sixes. The Elite Division of the Toronto and District Cricket Association begins this weekend with two matches on Saturday, both at Maple Leaf CC (King City), and three on Sunday. West Indians faces Overseas and PCB takes on Vikings on Saturday (May 24) at King City. On Sunday, current champions Brampton Masters plays West Indians at King City, Toronto’s Ross Lord Park, hosts Vikings against PCB and Cavaliers versus Yorkshire and Centurions visit the Toronto Cricket, Skating and Curling Club. The Hamilton and District Cricket League season begins on Saturday with a match featuring Hamilton Colts and Mississauga Colts at the Iceland Oval, Mississauga. On Sunday, Hamilton CC hosts Mississauga Ramblers, Cambridge meets current champions St Catharines and Crescent, top of the 2007 regular season standings, plays Oakville. Play also begins in the Southern Ontario and Scarborough Cricket Associations. Three matches are scheduled on Saturday in the Scarborough Premier, with two more on Sunday. The Southern Ontario has two games in Waterloo on Sunday. Christ Church Cathedral and Canterbury meet on Sunday in the opening game in this season’s Ottawa Valley Cricket Council. Four matches are scheduled this weekend in the Citizen Division. The Quebec Cricket Federation season began last weekend. Matches are played in the Montreal area. The USA returned to international cricket with a 9 wicket win over Mozambique on the opening day of the ICC World Cricket League Global Division 5 in Jersey on Friday. Sushil Nadkharni scored 70 runs not out as the US reached 150 runs for the loss of 1 wicket in the 28th over after holding its opponents to 148 runs for 7 wickets in 50 overs. Syed Ahmed made the highest score of the day with 133 runs not out as Norway piled up 360 runs for 3 wickets in its 50 overs against Vanuatu. His side went on to win by 183 runs, bowling out Vanuatu for 177 runs in the 40th over. The one bowler to capture 5 wickets on opening day, Takuro Hagihara of Japan, ended up on the losing side. He took 5 wickets for 56 runs as Afghanistan was bowled out for 179 runs. Japan was then dismissed for 87 runs and lost by 92 runs. Host team Jersey made a good start with a 93 run win over Singapore, a country that has dropped down the international cricketing order since playing in the top division of the ICC Trophy in Canada in 2001. Botswana beat Bahamas by 70 runs and Nepal beat Germany by 7 wickets in the other opening day matches. The top two teams from this event progress to ICC WCL Global Division 4 in Tanzania in October. There they are joined by Hong Kong, Fiji, Italy and Tanzania. The top two from that stage progress to ICC WCL Global Division 3 in Argentina next January. The Division 3 top two advance to the ICC World Cup qualifying event in the United Arab Emirates in April 2009, where they are joined by leading ICC Associate countries, including Bermuda, Canada, Ireland, Kenya, the Netherlands and Scotland. The top four from the World Cup qualifying event will play in the 2011 ICC Cricket World Cup in South Asia. The final of WCL Division 5 is scheduled for May 31. Port Credit by just one run in the second game. cold with the persistent wind. tournaments that will grow bigger and better. Adastrians Cricket Club - the most famous and successful cricket club in Quebec. This is not only just a cricket club, but also a place where all the members and supporters come, get together and enjoy the beautiful life with the rhythm of cricket. Ice hockey, baseball, skiing and skating are widely regarded as the most popular sports in Canada. And cricket - that's right cricket - is aiming to join that elite group. It is estimated that there are 12,000 players within the Canadian Cricket Association, playing in 400 teams around 145 grounds. Not bad for a country with a population of 30 million - just over half of England. In Quebec, there are 6 different divisions and there are more than 54 teams playing on a daily basis. The excitement of the All-American pastime of baseball is easily translated to all parts of the globe with few sports around the world that elicit the same support and excitement. Cricket is such a game that has historically evoked the same feelings of camaraderie, competitiveness and well being. Originally played by the English, this game quickly spread to all over the world. Now Cricket is second only to Soccer in popularity. Launched on May 1 2003, " www.adastrians.com " is your own cricket web site, offering you volumes of information and opinion, not to speak of contests and loads of fun. The site continues to be a proactive portal that will answer every cricket fanatic’s needs for coverage of matches, prompt updates and news-breaking stories. Adastrians recognizes the fact that the medium allows ready interactivity. The interactive features include match reports, schedule, daily poll question, cricket coaching, local cricket news and discussion boards besides encouraging young cricketers to express themselves by writing in their own columns. The objective of Adastrians Web Site is to provide some fundamental guidelines for cricketers wishing to be the best they can be. At the junior and senior representative level it is necessary for players to have obtained a certain degree of ability in all aspects of the game. It is the aim of Adastrians to provide direction for our young players to follow, while providing coaches and parents with a benchmark to best assist the developing player. The cricketer was proud of his progress as a batsman and invited his mother-in-law to watch him play, hoping to impress her. At the crease, he turned to the wicketkeeper and said, "I'm anxious to do well and really hit this ball. That's my wife's mother over there." "Don't be silly", said the wicketkeeper. "You'll never hit her at two hundred yards." It rained and rained — then it rained some more. Then it stopped raining, but by then it was dark. We all went home. We all came back the next morning when it wasn't raining. It started raining again, but not for long. The rain was replaced — by hailstones — but not for long. Suddenly, it started stopping — we all held our breath... the heavens opened above King City... and a small patch of blue sky appeared over a distant field. The patch grew larger — the dark rain-filled clouds began to blow away and, after a day and a half of frustration, the Canadian National T20 Championship could resume. Not immediately you understand; no matter how enthusiastic you may be, no groundsman worth his salt is going to allow you to play on a damp, soggy pitch until it dries up. This, like so many facets of cricket, can take a while. Twenty20 cricket in Canada is no different to T20 cricket anywhere else — you’re at the mercy of Mother Nature, so it was somewhat appropriate that the inclement weather had players and officials scratching their heads for an acceptable solution. T20 Cricket is designed to be short and stimulating — a full game should be done in less than three hours — but perhaps not this short. In the event, the four semifinalists resolved to play two 10-over games (five overs, or 30 balls, per team) followed by a 15-overs a side final lasting around two hours. The action, when play was finally possible just after lunch on Victoria Day, was fast and furious — just the way the organizers and sponsors had hoped. The semifinals even produced two upsets, which meant Ontario's second team beat its senior counterparts while Quebec celebrated a famous victory over pre-tournament favourites, British Columbia. Genuine inter-provincial rivalry followed in the championship game as Ontario 'B' eased to a comfortable win over Quebec despite some lusty, late-order hitting from the eventual runners-up. On another weekend, had the weather co-operated, a fraction of the thousands of motorists thundering up and down nearby Highway 400 to and from Cottage Country might have taken the short detour via King City to witness the birth of a new, fan-friendly form of cricket in Canada. There is genuine talent on these shores and rich entertainment on offer for those prepared to give it a go. There is talk of international T20 Cricket coming here in the summer and it needs public support to help grow the game. It also needs promoting in our schools and workplaces. Media attention is vital, not only to raise awareness, but also to radically alter the perception of a sport hitherto seen as over-long, incomprehensible, and irrelevant. All these things take time, but at least Cricket Canada is ready to leap out of the Dark Ages, move with the times and experiment with a fresh approach. Cricket will never be everyone's cup of tea, however good the tea may be. But this new slant on an ancient and noble art may just persuade some to pack up the picnic and head out to a whole different ball game. Surrey Hawks cricket club was formed in 2007 when former Burrard cricket club members sought to join the Metro Vancouver Cricket League. Surrey Hawks is the first new club in MVCL but Hawks players have been in the local league for the past four years. Hawk players started playing in the BCMCL as Burrard II and did a pretty darn good job of bringing some respectability, winning tradition and past glory to Burrard cricket club. In two years as members of Burrard II the team won one division title. Hawk players joined Abbotsford cricket club as free agents and played there best cricket. Hawks played a major role in Abbotsfords moving to the first division. Hawks are fielding two teams in the upcoming season and looking forward to a exciting and fun filled season. 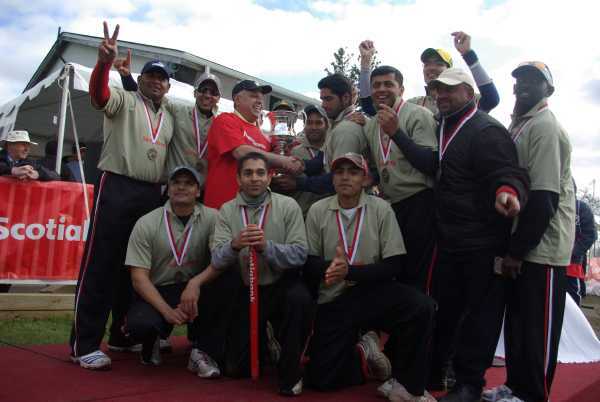 Ontario B claimed the 2008 national T20 cricket championship on Monday, defeating Quebec in the final in King City, Ont. Ontario B won by 16 runs, 120-6 (15 overs) to 104-9 (15 overs). Eion Katchey scored 15 runs, not out, for Ontario B to earn man of the match honours. Both Ontario B and Quebec were surprise finalists after winning rescheduled semifinal matches earlier Monday. Those contests, originally set for Sunday, were reduced to five overs a side after being postponed due to rain. Quebec earned a berth in the final by knocking off defending champion British Columbia by four runs, 41-5 to 37-8. Ontario B got there by beating Ontario A by four wickets, 29-6 to 28-8. Ontario A's Harvir Bhaidwan received both the man of the series and best bowler awards. Quebec's Jabbar Chaudhary was named best batsman, while teammate Roshan Jagaseelay captured the prize for best fielder. This year's Canadian cricket championship was the first contested under the Twenty20 format, which is sweeping the sport worldwide. The new style limits each side to 20 overs (120 balls) and puts a 75-minute time limit for each side's inning. Manoj David scored 59 runs, not out, to lead British Columbia to its third straight victory at the national cricket championships on Saturday evening at King City, Ontario. The defending champions took their third match of the day on Saturday by defeating Nova Scotia by 28 runs, 143-2 (20 overs) to 115-5 (20 overs). "I think we have to be pretty pleased with this," said B.C. team member Geoff Barnett. "The boys bowled really well." It was the first day of Canadian cricket's new life after a switch to the Twenty20 format, which is sweeping the sport worldwide. "I played a lot of this format in New Zealand. It's quite an attractive brand of cricket to those who normally wouldn't watch the game," said Barnett, adding that most of the Canadian players liked the switch from the old format. "I think about 95 per cent prefer this format, especially in Canada where we play an attacking style of cricket anyway." B.C. leads Group A with a record of 3-0, with Ontario B at 2-1, Alberta at 1-2 and Nova Scotia still winless at 0-3. On the other side, Harvir Bhaidwan's four overs of bowling saw him allow 11 runs and three wickets taken as the Ontario A squad defeated Saskatchewan by nine wickets to remain undefeated. Also in Group B action, Quebec improved to 2-1, Manitoba sits at 1-2 and Saskatchewan is 0-3. In other second-round matches, Rizwan Cheema's three overs of bowling, including two maidens, just five runs allowed and one wicket taken, led Ontario B to a 76-run win over Alberta. And Asish Patel took four wickets while allowing 14 runs in four overs as Quebec downed Manitoba by seven wickets. The tournament semis and final will be played on Sunday afternoon. Barnett scored 59 runs, not out, to lead British Columbia past Alberta by nine wickets, 101-for-1 (16.5 overs) to 97-for-8 (20 overs). Bhaidwan's strong four overs of bowling, including a maiden (six balls, no runs), just five runs allowed and two wickets taken, led Ontario A to its second win, this time sailing by Quebec by nine wickets, 72-1 (15.5 overs) to 71-10 (18.4 overs). Chris Manohar was 43, not out, to lead Ontario B to an 88-run victory over Nova Scotia, 168-5 (20 overs) to 80-6 (20 overs). And Qamar Zahah took four wickets while allowing 18 runs in 3.5 overs as Manitoba beat Saskatchewan by five wickets. Manoj David scored 32 runs at bat and took two for 24 off his four overs as a bowler to lead defending B.C. to a tight win over Ontario B.
Alberta's Zulfiqar Husain scored 42 runs and bowled two wickets for four runs in two overs as his side cruised to an easy victory over the first-time side from Nova Scotia (67-0 in 9.3 overs to 64-10 in 19.2 overs). Bhaidwan bowled an outstanding 3.5 overs for one maiden, six total runs and a wicket as Ontario A overwhelmed Manitoba by eight wickets. And Abdul Jabbar scored 57 runs in a big win by Quebec over the other newcomer, Saskatchewan. Quebec and Ontario A progressed to the semi-finals of the Scotiabank National T20 Cricket Championship 2008 with wins under the Duckworth/Lewis (D/L) system against Alberta and Nova Scotia respectively. The games between Manitoba and Ontario B, and British Columbia and Saskatchewan did not complete as persistent rain made the grounds unplayable at Maple Leaf Cricket Club, King City, Ontario. Players and match officials became frustrated by the delay in announcing a decision on a revised schedule for Monday. It came as a surprise to see that play had resumed in both the Quebec-Manitoba and Ontario A-Nova Scotia matches given the continuing rain. The latter match was decided under the D/L system as Nova Scotia had completed batting for 5 overs. Captain Abdool Samad launched the Ontario A innings with a brisk 26 runs, all-rounder Umar Bhatti made 20 runs and Ritchie Karpoor crowned the innings with 54 runs not out off 36 balls. Shreyas Dond took 2 wickets in the same over for Nova Scotia. Opening batsmen Zulfikar Hussain made 40 runs in 42 balls and Anuraj Gupta scored 27 runs as Alberta reached 125 runs for 5 wickets in its 20 overs. Quebec rattled off 22 runs, as the weather threatened, in just 2.5 overs. The play stopped for rain, but eventually resumed. Abdul Jabbar continued to lead the Quebec batting, this time racing to 42 runs not out as his side reached 87 runs for the loss of 1 wicket after 12 overs. Common sense then prevailed and play was again halted. Quebec was ruled the winner under the D/L system. The Alberta-Quebec game was the first where two provincial flags were flying on the flagpoles by the side of the playing area. Saskatchewan scored 63 runs for 8 wickets in 20 overs against British Columbia. Tanzil Rehman, from Victoria B.C., took 3 wickets for 8 runs in 4 overs. British Columbia was on 2 runs for 1 wicket when the heavy rains stopped play after 1.5 overs. Canadian international Mohsin Mulla took 3 wickets for 8 runs and Eion Katchey took 3 wickets for 11 runs as Ontario B bowled out Manitoba for 61 runs in 18 overs. Joe Lovelace made top score with 13 runs. One Nova Scotia player dislocated a shoulder in the opening match of the tournament when he fell and landed on his shoulder in running between the wickets to try and score a run. He was taken to hospital and the shoulder has been put back in place. Some of the pitches were damp on the opening morning. A number of players slipped either fielding or when batting in the first round of matches, but pitches and outfields dried later in the day as the sun shone. There was a lot of discussion, rumours of 8am and 10 am starts for Monday’s play at the ground. But the faithful are likely to be back on Monday to see what transpires. The concept of public announcements seemed alien and the official Cricket Canada website lacked self-evident plans for Monday’s revised schedule. At least the weather seemed to improve later in the afternoon but sun and/or wind will be needed to help dry the grounds. BC and Ontario A each won the second of three matches in the respective groups. BC made 98 for 1 in 16.5 overs to beat Alberta 97 for 8 wickets (20 over). Canadian international Geoff Barnett scored 53 runs not out for BC. Ontario B beat Nova Scotia by 88 runs. The Ontario B total (originallyl 148 for 5 ) became 168 runs for 5 wickets due to repeated running on the pitch penalty runs against the batsmen, 4x 5 runs penalties. Nova Scotia made 80 runs for 6 wickets in 20 overs. Canadian internationals Asif Mulla 36 runs not out and Trevin Bastiampillai 31 runs not out took Ontario to victory. Manitoba beat Saskatchewan by 5 wickets. Manitoba 75 for 5 wickets (16.1 overs). Suresh Jayaraman 28 runs. Saskatchewan was all out for 74 (15.5 overs). There were wins for Alberta, British Columbia, Quebec and Ontario A in the opening round of T20 matches. BC was well on the way to a comfortable win over Ontario B, but there was a fight-back with a 6 over deep mid-wicket by Steve Welsh effectively bringing the win in the last over. Abdul Jabbar's 83 runs took Quebec to 153 runs fo 4 wickets against Saskatchewn in a game reduced to 15 overs a side. Saskatchewan made 83 for 4 in its 15 overs to lose by 70 runs. Alberta powered to a 10 wicket win over Nova Scotia, reaching 67 runs in 9.3 overs against a Nova Scotia of 64 all out in 19.2 overs. Zukfiqur Hussain made 42 not out for Alberta. Ahmed Joshi made 30 for Nova Scotia. Manitoba was bowled out for 65 against Ontario A, who made a winning 66 runs for 2 wickets in 14.5 overs. Aftab Shamshudeen made 23 runs for Ontario. Next matches are BC v Alberta and Ontario B v Nova Scotia in one group. Ontario and Quebec faceoff with 1 win each in a key encounter, while Manitoba and Saskatchewan meet in the other group..
Woodlands won the Peel Regional Senior Boys indoor cricket final on Thursday (May 15), after notching a win in Wednesday’s Junior Boys final. Father Goetz won the Girls competition. Both boys finals went down to the wire, Woodlands beat T.L. Kennedy by 1 run in the Senior event. The Junior final with North Park was tied for the allotted 6 overs per side. Woodlands won due to scoring 1 more run after 5 overs. The Peel Region includes the communities of Mississauga, Brampton and Caledon. In Peel Region, the Senior Boys competition has a maximum of 8 overs per side. The Junior Boys and Girls competitions play a maximum of 6 overs per side. Six wickets, or outs, mean a team is all out. The Senior Boys event had 32 competing schools, the Junior Boys 17 schools and the Girls involved 8 schools. Thirty-two schools competed in three qualifying groups at the Senior Boys level in Peel. X teams progressed to a preliminary playoff, with winning sides going on to the quarter-finals. In the semi-finals, Woodlands made 54 runs for the loss of 5 wickets in its 8 overs to defeat Central Peel by 18 runs. Central Peel was all out for 36 runs after 7.3 overs. John Fraser made 45 runs all out in 8 overs but was edged out by T.L. Kennedy with 1 ball to spare by 1 wicket. T.L. Kennedy scored 46 runs for 5 wickets in 7.5 overs. Woodlands made 54 runs for 4 wickets in its eight overs in the Senior Final. It was another nail-biter as the last wicket fell in the TL Kennedy innings with 2 runs needed for victory off the last two balls of the game. Kennedy was thus all out for 53 runs and lost by just 1 run. Both finalists had qualified from the Central qualifying group. Father Goetz was top in the South and (Central Peel) headed the standings in the North. Woodlands squeezed home in the Final, thanks to a run count-back after each side made 30 runs. Scores after 5 overs were then compared; Woodlands had made 29 runs and North Park was left 1 run adrift at 28. North Park had scored 30 runs for 5 wickets in 6 overs. Woodlands made 30 runs all out in 5.1 overs. Woodlands reached the Final thanks to a 16 run semi-final win over T.L. Kennedy. North Park reached the semi-finals after a 10 run quarter-final replay win over Rick Hansen. The first match had been tied. North Park beat Erindale by 13 runs in the semi-final, after scoring 65 runs for 4 wickets in 6 overs. The Junior Boys competition attracted an entry of 17 schools that was divided into two qualifying groups. The finalists had topped the qualifying groups. Woodlands won the South and North Park the North division. The Peel Girls indoor cricket competition involved eight schools, playing in one qualifying group. The top four teams then contested the semi-finals. Father Goetz beat Port Credit by 21 runs in one semi-final and Rick Hansen beat St Joseph by 5 wickets with 2 overs to spare in the other game. Father Goetz scored 50 runs for the loss of 5 wickets in 6 overs in the Final. The bowlers then restricted Rick Hansen to 28 runs for 3 wickets (6 overs) to win by 22 runs. The indoor cricket season for west district Toronto Schools saw North Albion win both Senior and Junior Boys competitions. The Seniors beat West Humber. Akash Shah scored 42 runs as North Albion made 76 runs and beat Kipling by 34 runs in the Junior Boys final. This season’s Toronto Schools outdoor cricket championships will soon be underway. Woburn beat Kipling at Eglinton Flats in the 2007 Championship game. Qaiser Ali (Captain, Adastrians), Mohan (Vice-captain, Sauve), Rahim Gilani, Abdul Jabbar Chaudrey (both Adastrians), Nirmal Seetaram, Jason Goolab (Centennial Sports), Randall Edwards (? ), Manish Patel (Jean Talon), Ashish Patel (Gujarat), O’ Brian Palmer, Glenroy Regis (both Montreal Caribbean Social Organization, MCSO), Syed Abis Hussain (Montreal Overseas), Kalpesh Patel (Kantha Vibag Sports Club, KVSC), Philip Patel and Abhay Patel (Navsari). It's loud, wild and fun. There are cheerleaders, night games, music, fans in the millions and a pack of high-profile owners. Television is constant, there's a reported 10-year, billion-dollar broadcast deal and players are being paid up to $1.5 million for 45 days work. Team names include Royals, Knight Riders, Daredevils, Indians, Chargers and Challengers. And if the games go longer than three hours, penalties are imposed. A competitor to the National Football League? Twenty20 cricket, to be exact, and just five years since being introduced in England, of all places, this new, fast-paced, adrenalin-charged game is sweeping the world and sending traditionalists running for the cover of their pavilions. And it has local adherents. This weekend, Cricket Canada is jumping on the bandwagon by holding its first national championship under the new Twenty20 rules, sending "50 overs" cricket to the wayside. Eight teams from seven provinces will compete May 17-18 in King City, just north of Toronto. They have a local cable television contract for the tournament with games called by the CBC's Nigel Reed, and a fair amount of media coverage. It is, however, nothing compared to what's happening in India. It was on April 18 of this year (a date that will live in infamy for cricket purists) that the Washington Redskins cheerleaders pranced onto the home field of the Bangalore Royal Chargers to get a crowd of over 30,000 up and dancing, ready to cheer the locals against the Kolkata Knight Riders. Signalling the opener of the Indian Premier League's inaugural season, the event also let cricket fans everywhere know the game was never going to be the same again. Eight clubs, some owned by Bollywood superstars (Shahrukh Khan is in the Kolkata group, for example) and others by Indian billionaires, and in one case a major daily newspaper, set out on a double round robin schedule that would see each play the other twice with the top four to the semifinals. It would take 45 days to bring the thing to a close and as of this writing, the Rajasthan Royals led the pack nine games in with a 7-2 record for 14 points, followed by the Kings XI Punjab and Chennai Super Kings at 12 and Kolkata Knight Riders with 10. Rounding out the standings were the Delhi Daredevils, Mumbai Indians and, as every league needs bottom dwellers, the Deccan Chargers and Bangalore Royal Challengers with four points each. Scores are high, power hitters rule and websites on the league and its stars are everywhere. Atul Ahuja, CEO of the Canadian Cricket Association, was there for the opener, and it helped shape his ideas about how the game could be packaged. "It's something new for [the Indian public]," he says. "It's like going to see a Bollywood movie, and more. "What this gives you is live [action] and seeing your favourite stars from Australia, Sri Lanka, New Zealand and India, right there in front of you, playing alongside each other. "And you have this whole inter-city hype, like here in North America." Indeed, everything about it is like professional sports on this side of the ocean, including the stars (each club can declare an "icon" player from India, and that means seven-figure salaries for Sachin Tendulkar, Yuvraj Singh, Sourav Ganguly, Rahul Dravid and Virender Sehwag), the television, the loud uniforms, tons of media coverage and, yes, those cheerleaders. Some of the clubs are actually developing their own cheer squads. Other key players include Jacques Kallis of South Africa (making a reported $900,000), Ishant Sharma of India ($950,000), Mahendra Singh Dhoni of India ($1.5 million) and Andrew Symonds of Australia ($1.35 million). Cost of a franchise reportedly ranged from $67 million US to $111.9 million US, all done by bid. "Stadiums are absolutely chock-a-block, it's being played at night, it's hot in India at this time and it's being televised globally every day, even here through Asian Television Network," Ahuja says. The key for all of this is simple — time. Or rather, lack thereof. When Ahuja was a boy in Pune, India, he would go along with his father and sister to five-day cricket tests. Dad would take his newspapers, Ahuja and his sister their homework, and out to the grounds they'd march, ready for a test of patience and their love of cricket. "And we'd watch the game for about an hour and then there'd be a tea break and [Dad] would catch up on his reading and we'd do our homework," Ahuja says. "And then the players would come back on the field and they'd be warming up [for a long time]. When I look back, it was almost quasi-comical. But that's just the way it was." Twenty20 refers to the number of overs — each team gets one inning of 20 overs, or 120 balls, and that's it. Score as many runs as you can and then get off and let the other team try and catch you. No bowler is allowed to toss more than four overs, or 24 balls. That's creating all sorts of new tactical opportunities for when you use you pace bowlers, or your spin bowlers. It also behooves a team to hold back a star for the end, like using a closer in baseball, to wrap things up. Cricket managers no longer sit around chatting about the weather or last night's meal any more, they have to pace back and forth and think along with the other team's boss. If the fielding team doesn't get all of its balls across within 75 minutes, the batting side gets a six-run bonus for each uncompleted over. Wasting time by the hitting team can cause the umpire to give more minutes to the fielding club. A tie is broken by a bowl-out. Five bowlers from each side deliver one pitch at an unguarded wicket and whoever knocks down the most wickets wins. There are other rules regarding where fielders can be placed and when, etc., but everything is arranged so television can show the game within three hours and the fans can come at night, have a good time and get home. The CBC's Reed, who grew up as a cricket fan in the southwest of England, admits the game is not for the purist, "but it sure is good entertainment. "It's obviously the ultimate in the quick fix for the cricket lover who doesn't have one day, three days or five days to sit in the sun and watch the game," says the broadcaster. "Certainly I think it's obviously more palatable for a North American audience, that much is clear. It's over in three hours, and that makes it a more watchable event." The IPL hasn't been without controversy, especially when dealing with national cricket organizations around the world that aren't too happy with their best players disappearing for 45 days at the start of the summer. And not all of it is simply national pride. Australia and England are both seriously looking at their own Twenty20 tournaments, so hanging on to the players becomes more essential. As for Canada, well, Ahuja has a dream. And it involves convincing the CBC or some other network that Cricket Night in Canada may be a timely idea. That would mean a Canadian league with a limited schedule attracting players from overseas. "I wasn't being facetious," he says. "Any sport grows on the back of how well it is marketed and how interesting it is from a technique, endurance and strength standpoint." Twenty20, he believes, fits that bill. A weekend professional Twenty20 cricket tournament involving top players from around the world playing along with the best Canada can offer is also something he'd like to see in the future. "If we had a game starting at 9 a.m. here, that's 2 p.m. in England, 6 p.m. in the sub-continent," Ahuja says. "That's a half-billion potential viewers." None of whom will have time to read the newspaper. The Nova Scotia provincial squad for this weekend’s Scotiabank National T20 Cricket Championship is made up of eleven players from Halifax CC and three from Dartmouth CC. Amit Joshi, who played for Pune University in India, is the captain. He is a 30-year old right-handed middle order batsman and bowls right-arm fast medium. The Manager and vice-captain of the side is Tushar Sehgal, who has played league cricket in Indonesia. Sehgal comes from Jallandhar, India and is 25 years old. The squad includes four players aged 30 or more, two are under 20 and the rest are mid-twenties. Right-arm fast medium bowler Shreyas Dhond (19) has attended some Canadian Under-19 training camps. He has previously attended an Under-16 cricket academy in India. Jitendar Jassal (36) is the wicketkeeper. The Saskatchewan squad for the Scotiabank National T20 Cricket Championship 2008 is likely to be one of the least recognized teams to followers of cricket in the Greater Toronto Area and eastern parts of Canada. However, the players do feature in inter-provincial matches in the western provinces and the local clubs sometimes play teams in neigbouring provinces during the season. Saskatoon Cricket Club (SCC), as Provincial Champions, is due to play in this summer's Western section of the John Ross Robertson Trophy, Canada's club cricket championship. Regina has two clubs: India-Canada Cricket Club (ICCC) and Pakistan Cricket Club of Regina (PCCR). There has been one late change, due to availability issues. Ravindra Lakdawala (SCC) replaces Prakar Shrivastava (ICCC). Both are middle-order batsman. Lakdawala is also a wicketkeeper. Imran Maqsood (Captain) Left-hand batsman, middle order. Plays for PCCR. Nippon Raval (Vice-captain) Left handed all-rounder. Middle order Left-hand batsman.. Left-handed medium fast bowling. Plays for Saskatoon Cricket Club. Iftekhar Kalyar All- rounder, Right arm medium fast bowler. Middle order batsman, who sometimes opens the innings. Arjun Patel Wicketkeeper. Right hand batsman in the lower middle order batting. Plays for Saskatoon CC. Alfred Trotman Alternate wicket keeper. Right hand batsman at number 6 or 7 in the order. Plays for PCCR. Iftekhar Anwar All rounder. Right arm medium fast opening bowler and middle order batsman. Plays for Saskatoon CC. Pran Z Chervallah Right hand batsman who, usually opens the innings.Right-arm medium bowler. Plays for Saskatoon CC. Ravindra Lakdawala All rounder. Right hand, middle-order batsman. Wicketkeeper. Plays for Saskatoon CC. Rafat Alim Right hand batsman, who usually opens the innings. Plays for PCCR. Vaibhav Rai Left arm slow bowler. Plays for ICCC. Bilal Syed Right arm slow bowler. Tail-end batsman. Plays for PCCR. Shiv Adapa All rounder, Right arm off-spin bowler. Middle order batsman, but may sometimes open the batting. Plays for Saskatoon CC. Jivjot Briach Right hand batsman. Usually bats at number three in the middle order, after the fall of the first wicket. Right-arm medium bowler. Plays for Saskatoon CC. Team Manager : Dr. Zia Rehman. Prakhar Shrivastava, who has had to drop out of the squad, is an all-rounder. Right hand, middle-order batsman. Medium fast second change bowler. Plays for ICCC. ** Thanks to Mr. Aizaz Ahmed, the President of the Saskatchewan Cricket Association, for the squad details. Cricketing history will acquire Technicolor sheen on Monday, May 19th in the inaugural Inter City Cricket Cup played at Powerade Center (formerly the Brampton Centre for Sports & Entertainment) in Brampton .CPC (Canadian Professional Cricket) is launching Inter City Cricket Cup. Eight City Cricket Teams Toronto, Brampton, Mississauga, Vaughan, Guelph, Markham, Scarborough and Oakville will contest with each other for 6 months to win the Trophy. Starting in May and finishing in September the teams will play every Friday on League basis and the Semi-finals and the Final will be in September. There will be 31 Matches and the first three matches will be played on the opening day Monday, 19th May (Long Weekend) of Inter City Cricket Cup. Dr Ruby Dhalla (Member of Parliament – Brampton Springdale) will inaugurate the event at Powerade Center. Inter City Cricket Cup will begin on Monday 19th May, at Powerade Center (formerly the Brampton Centre for Sports & Entertainment) in Brampton. "It's a Long Weekend Holiday on Monday and we want families to join us for a whole day of Non-Stop Cricket Action", said Rajinder Gadi who is in charge of Public Relations at CPC. "We have Live DJ, Dance performances, Singers and food stalls for entertainment at Powerade Center". CPC is also launching a Cricket Academy on 19th May for Kids, Adults and Professional Cricketers. "We want to create a Cricket structure where Canadian cricketers can play with their fellow countrymen and against their counterparts across the globe and be rewarded for excellence", said Yudhvir Jaswal who is Director Marketing at CPC. He further added "We need to provide an environment for young, talented, up-and-coming players that will keep them motivated and interested in developing their careers in the sport of cricket, allowing them to better themselves, not only in the sport but financially as well". Inter City Cricket Cup will feature very good cricket players and some of them are the best in domestic cricket said Azhar Hussain , Director Operations (CPC). All the Eight City Teams are very strong and we hope to see exciting cricket throughout the summer. "I am happy with my team and the preparations have been good," Balbir Singh, Captain of Mississauga Superstars Team said. Toronto Warriors Team has ensured that they will be playing their best team and their Captain also claim's they have the Fastest Bowler in Canada in their team. Meanwhile a few eyes in the stands will also peer at the skies, May is known for surprise summer showers but on Monday, fans would prefer to sweat rather than carry an umbrella. The forecast meanwhile hints at clear skies. It better be, especially when cricket seems to be bracing for a new sunrise in the form of Inter City Cricket Cup. The popularity of Twenty20 cricket has spread to Canada, including a chance that Indian Premier League teams could visit the country following "advanced" discussions, Cricket Canada has confirmed to Cricinfo. The board held talks with important IPL figures at the start of the Indian tournament last month but have so far been offered "no promises and no confirmations". "Atul Ahuja, Cricket Canada's chief executive, had discussions with leading individuals in respect to possible visits to Canada by IPL teams," a CC spokesperson said. "In some cases, those discussion were quite advanced, but at the moment there are no promises and no confirmations." Either way, Twenty20 will be taking centrestage for the next few months in Canadian cricket. The first-ever national Twenty20 championship will be held over the weekend of May 17 and 18 at King City near Toronto, on four turf pitches. There will be 12 matches per day, involving teams from Briitsh Columbia, Alberta, Manitoba, Ontario, Quebec and Nova Scotia. The competition is a formal Cricket Canada event in partnership with their new major sponsor Scotiabank. "There is growing commitment to the Twenty20 format across the country," said the spokesperson, "in part because it fits perfectly with the North American sporting format." The Toronto and District Cricket Association now has a separate Twenty20 League, as does the Etobicoke and District Cricket League in the suburbs of Toronto. In British Columbia, their mainland competition launched a Twenty20 league in April, with Sri Lanka's Arjuna Ranatunga as the chief guest. There will also be a non-representative team from Canada at the upcoming MAQ T20 Cricket Festival May 23-25 at the Broward Stadium north of Miami, Florida. The Twenty20 arrangements are aimed at solidifying cricket across Canada. "It's also geared to preparing Canada for playing more Twenty20 cricket internationally," the spokesperson said, "with a particular eye on the Associates tournament in Ireland in August and the June 2009 Twenty20 World Championships." Canada's cricket championship has been changed from a week-long marathon to a two-day sprint. That's good news for fans, the new boss of the national association hopes, as he and his group get ready for this year's competition May 17 and 18, at the Maple Leaf Cricket Club in King City, just north of Toronto. Eight teams representing seven provinces will compete in a new format that dumps the traditional 50-over/300 ball game in favour of the hot new Twenty20 style sweeping the world's professional ranks. "We've basically had a situation [over the years] where we had good cricket played in Canada but not a lot of spectators because of the length and duration of the games," said Atul Ahuja, a banking- and technology-sector executive who took over the association last November. "The idea was to … introduce a shorter version that's more exciting and full of a lot more entertainment and that would be attractive to spectators." When he says shorter, Ahuja is not kidding. Since "limited overs" cricket was introduced in the early 1970s as an answer to five-day test matches, the nationals have featured seven-hour games spread over seven days — a test both of the players' and provincial teams' pocketbooks, and fans' resilience. Twenty20 cricket, first introduced in England five years ago, has a number of unique rules designed to fit the game into a more television- and fan-friendly style, including only 20 overs that must be bowled within 75 minutes, penalties for time wasting and a maximum of four overs (24 balls) for each bowler. Organizers will be using four pitches at King City that will host 24 games over two days — a breakneck pace for cricket. Saturday games will be free for spectators, with a full-day Sunday pass going for $5. Ahuja admits there was some resistance from the traditionalists to switching to Twenty20 cricket, but they worked it out. "The surest way to have money come into the sport is to have spectators, which draws in sponsors and also basically draws in the government to come support when [it] sees a sport contributing to the economy," he said. "There is resistance, but I think we've been able to come to a happy medium or a compromise … let's put it that way." Scotiabank has signed on as premiere national sponsor and official bank for Cricket Canada. Defending 2006 champion British Columbia will be back next Saturday, along with Alberta, Manitoba, two Ontario teams (due to the number of players in that province), plus first-time clubs representing Saskatchewan and Nova Scotia. A number of players from the 2006 cricket World Cup club will be in action, including Umar Bhatti, Geoff Barnett and Sunil Dhaniram. There will also still be time for tea — it will simply happen between games rather than between innings. "You still break for tea, it's just a more efficient game, it's physically a more demanding game and mentally a more scientific game," Ahuja says. Canada's national team will be chosen after this tournament ends, though not just from players at King City as some of the top performers were not available to compete. Law-maker the MCC has outlawed some modern bats after an overwhelming vote to rewrite one of cricket's key laws. With a two-thirds majority needed, 98.6% of members voted to re-write law 6, which calls for "equal balance between bat and ball". The new law now stipulates that 90% of the volume of bat handles should be made of cane, wood and/or twine. The other 10% can be used "for the purpose of reducing vibration, for example rubber". The handles, including the splice, must also not exceed 52% of the overall length of the bat and the law also restricts the thickness of materials that can be used to protect and repair bats. The MCC, guardians of the laws of cricket, had been concerned by the use of carbon-fibre and graphite in modern bat handles, which gives extra strength and also makes them lighter. "In cricket, the battle between bat and ball is key," said MCC head of cricket John Stephenson. "If one comes to dominate the other, the game will become predictable and less enjoyable to watch. "While cricket pitches, balls and boundaries have changed little in centuries, modern bats have developed to the extent that mis-hits are now clearing the boundary rope for six. "By ensuring that bats are made in the traditional manner, MCC hopes to safeguard the traditional balance of the game. "Modern training methods have allowed many batsmen to become stronger and fitter than their predecessors, thus hitting the ball players, but rather the new material that could give them an unfair advantage." The new law will come into effect from 1 October this year, when all bats used in the professional game will have to meet the new standards, though any amateur player in possession of an illegal bat would be allowed to continue using it "for the rest of the bat's natural life". The MCC said in compiling the law change, it consulted the International Cricket Council, governing bodies of Test-playing countries, bat manufacturers, scientists as well as suppliers of willow and cane to ensure they could meet demand. It will also carry out random tests on bats over the world to ensure the law is being implemented. Modern bat handles are made with a hollow carbon-fibre shaft, fixed to the blade with a wooden plug, and housed in moulded foam, while traditional bat handles are a mix of cane and rubber, guarded by a linen thread, weighing up to six ounces more. Modern bats make up the weight in the depth of their blades, increasing the potential force in the middle of the bat. Before the change, there was little prescription on bat-making beyond maximum width (4.25in), length (38in), and that the blade should be made entirely of wood. In 2006, a bat made by Kookaburra and used by Australia captain Ricky Ponting, was deemed illegal because its blade was backed by a graphite strip which the MCC ruled was "likely to cause unacceptable damage to the ball" (Law 6.2). The ruling was backed by the ICC and the bat was withdrawn by the manufacturers. Marylebone Cricket Club yesterday voted in favour of introducing new restrictions on cricket bat manufacturing, hoping to "safeguard the game's traditions" while redressing the balance between bat and ball. Wednesday's vote on Law 6 won the two-thirds majority required to define for the first time the design and materials allowed for cricket bat construction, amid concerns that the equilibrium of the game has swung too far in favour of batsmen. The MCC have been looking into the rule change for four years after numerous changes have been made in bat materials. Ricky Ponting sparked controversy in 2006 when his 'Kahuna' Kookaburra bat was adjudged illegal by MCC as it had a graphite strip bonded to the back of the blade. The bat was subsequently withdrawn, but the law remained unchanged despite worries that bat manufacturers possessed to much influence over the way cricket was played. The new clause will require bat handles to be made from 90 per cent cane, twine and glue, while the other ten per cent may be used for material for gripping - commonly rubber. Composite materials such as graphite and titanium will be prohibited by the restrictions, which will apply from October. After extensive talks with the International Cricket Council and governing bodies of Test playing nations around the world, as well as contacting nine different bat manufacturers including producers in India and Australia, MCC last month sent out postal voting forms to all 18,000 members, proposing the law change. John Stephenson, MCC's head of cricket explained the necessity for the new law: "In cricket, the battle between bat and ball is key. If one comes to dominate the other, the game will become predictable and less enjoyable to play and watch. "While cricket pitches, balls and boundaries have changed little in centuries, modern bats have developed to the extent that mis-hits are now sometimes clearing the boundary rope for six. By ensuring that bats are made in the traditional manner, MCC hopes to safeguard the traditional balance of the game." MCC have employed other sports as examples in their justification for change, especially American baseball where titanium and aluminium bats have already been banned for similar reasons. "We have seen the impact of new technology and materials on other sports. Golfers drive the ball enormous distances, tennis players serve at greater speeds, footballers can dip and swerve the ball extravagantly - if the development of cricket bats is left unchecked the balance could be tipped too far towards batsmen. "Modern training methods have allowed many batsmen to become stronger and fitter than their predecessors, thus hitting the ball harder and further. MCC is not trying to legislate against those players, but rather the new materials that could give them an unfair advantage." The revised Law 6 will also introduce a grading system for bats, which will allow some leeway on materials for use in lower-level cricket. All bat manufacturers will be required to submit their designs to MCC, who will be responsible for grading. MCC will also adopt a policy of random bat testing to ensure that the new law is complied with. The domestic cricket season has begun outdoors in some parts of Canada. Play began in late April in British Columbia, where there are now three leagues. The longstanding Victoria and District Association, and the British Columbia Mainland Cricket Leagues (BCMCL) are now joined by the Metro Vancouver Cricket League. The Metro Vancouver league includes some of the leading clubs previously with the BCMCL, such as Meraloma and Salim Akbar. The opening matches in the new Metro Vancouver Cricket League saw Salim Akbar win by 2 wickets in a good early season match against Meraloma and also beat Windies by 44 runs while Richmond powered to a 156 run win over Surrey. There also has been some 20/20 early season play in the two other British Columbia leagues. Alberta has a 20/20 competition this weekend (May 3 & 4) at Riley Park, Calgary, to help prepare for the upcoming National 20/20 competition at Maple Leaf Cricket Club, King City, Ontario that is due to begin on May 17th. The Alberta event includes teams representing both the Edmonton and Calgary District Cricket Leagues, Saskatchewan and an Alberta Select side. The Calgary and District League then starts in earnest with two weekend divisions – the Premier (7 clubs) and Division 1 (5 clubs) – and a weeknight league of 13 teams playing 15 overs-a-side cricket. The Manitoba Cricket Association is staging some 20/20 matches at Assiniboine Park on May 10 & 11 to help prepare for the National tournament. The Manitoba league will be playing some matches in Brandon/Virden and Gimli this summer, where there is said to be demand for cricket. Hopefully this will lead to expansion of the game in that province. The ‘A’ division comprises 9 teams and the ‘B’ Division 4 teams with two recreational sides in the overall playing mix. Cricketing action begins in the Greater Toronto Area on May 10th with action in the Etobicoke and District League and Canadian Commonwealth Cricket Association of Toronto (CCCAT) League. The new 9-team Elite Division of the T&DCA begins on May 24. Some divisions begin earlier. The Hamilton and District Cricket Association (HDCA) season begins on May 24, the same weekend that the Ottawa Valley Cricket Council’s top 50-over league – the Challenge Division - starts. The leading eight teams in the OVCC are involved in a 20/20 competition that began this weekend (May 3). The HDCA now includes two colts teams, one from Hamilton, the other from Mississauga. A Tri-Nations ODI series involving West Indies, Canada and Bermuda is due to be played in late August at the Toronto Cricket, Skating and Curling Club. Canada is due to be involved in the ICC Associates 20/20 Qualifying Tournament, an Intercontinental Cup match and an ODI against Ireland in early August. The ICC Americas Regional Division 1 championship is set for November in Florida. Canada's women recently toured Trinidad & Tobago, losing all 5 matches, but gaining good experience. The team wore shirts with the Scotiabank name and logo, reflecting a new 3-year sponsorship the Bank has offered to Canadian cricket. Four members of the ICC Americas Under-15 squad that has been playing in the CLICO International Under-15 Championships in the West Indies are from Canada. Canada have joined the Twenty20 bandwagon and will host their first tournament in Toronto on May 17 and 18. Eight teams from British Columbia, Alberta, Saskatchewan, Manitoba, Ontario, Quebec and Nova Scotia will compete. "In the light of what is happening in the IPL in India at the moment, what we are undertaking in Canada is a major step to restore this sport to its former glory which it enjoyed till ice hockey replaced it," the board's CEO Atul Ahuja said. Ahuja was present at the launch of the IPL in Bangalore last month and said that the owners of the franchises had indicated a willingness to send teams to Canada. "All of them ... promised to send Twenty20 teams to Canada in the summer to help us groom players. We have a huge talent from the South Asian and Caribbean communities in Canada." However, if they do, the sides are unlikely to bear much resemblance to those playing in the IPL at the moment and most of the high-profile players will be on international duty elsewhere.